Both Loveland and Arapahoe Basin ski areas turned on their snow guns last weekend as a cold front passed through the state and lowered overnight temperatures. The manmade snow supplements natural snow that fell in two separate storms late last month, moving both resorts closer to opening day. 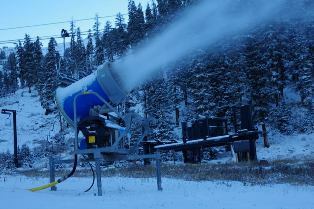 Arapahoe Basin ski area has been making snow since last Friday (A-Basin photo). During an unusually dry fall last year, Loveland opened for the season on Oct. 23, with A-Basin opening first on Oct. 17. The two ski areas high atop the Continental Divide typically duel to be the first to open in the state, sometimes starting the lifts as early as the first week of October. Loveland’s snowmaking crew also started up the guns Friday night and will work their way down Catwalk, Mambo and Homerun for opening day. Sections of the three trails form a top-to-bottom run that’s more than a mile long and drops nearly 1,000 vertical feet. It usually takes two to three weeks for Loveland’s snowmaking crew to cover the top-to-bottom run with an 18-inch base and tree-to-tree coverage. Loveland started making snow on Oct. 4 last season. Go to the websites for both Loveland and A-Basin for the latest snowmaking updates. Forecasters are calling for partly sunny and dry weather to continue through Thursday, with another storm rolling in late Thursday and possibly dropping anywhere from 6-12 inches at altitudes down to 6,500 feet by Friday.